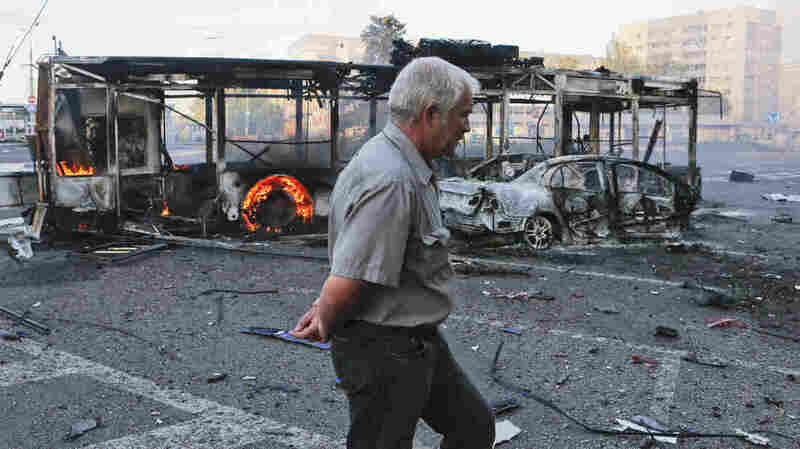 A man walks past burnt vehicles near a railway station after recent shelling in Donetsk, eastern Ukraine, Aug. 29. Shelling has gone on almost nonstop for months in and around Donetsk, which is the largest city in eastern Ukraine. A third of the 1 million residents have fled this regional capital. Yet other than emptier than usual streets, life appears oddly normal here. Municipal workers who have remained are ensuring electric power and running water reach as many homes and businesses as possible. Public buses are running. Trash is picked up, and bushes in the many parks and boulevards are manicured. The flowers get watered. City workers are also quick to respond when the war strikes in the heart of Donetsk. 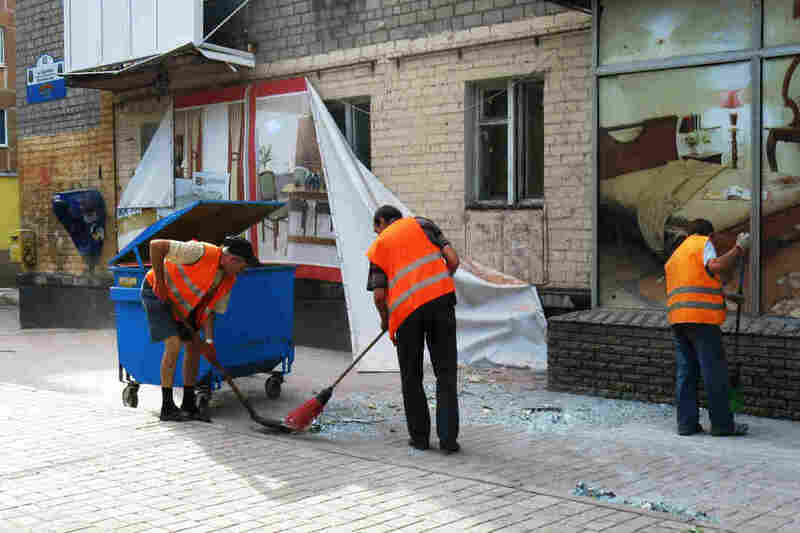 On a recent morning, hours after an artillery strike killed three people in a passing car and blew out storefront and apartment windows in one neighborhood, a half-dozen street sweepers showed up to remove glass and debris from the sidewalks. We understand that keeping going is the only one way not to go mad in a city which is seized and occupied. That's why it's so important to water flowers every day ... because people should get the hope that normal life will come back soon. One of them is Vladimir, who says he's 65 and a retired janitor. Like most of the municipal employees interviewed for this story, he is afraid to give his last name. Vladimir says he works as a street sweeper to supplement his meager pension of $80 a month. His is a dangerous occupation these days. In late July, a street sweeper was killed when a shell struck in another part of town. Vladimir shrugs off the risk, and says he takes pride in his work. "It's important to come here day after day to keep the city clean," he explains. That's how 54-year-old engineer Sergei feels about his job, too. He and his team of electricians restored the water supply to the city after heavy fighting cut power to the main filtration plant located north in Yasynuvata last month. Sergei says the shelling is a constant worry for him and his men given that they work outdoors. "Several times we were making repairs to electrical stations around the city, but the shelling would start and we'd have to quit our work before we were done and leave," Sergei says. The engineer says he has often considered leaving Donetsk, but that if he does, he worries his men won't stay either. The engineer adds that someone has to make sure the power stays on. Konstantin Batozky, who is a senior adviser to Kiev-appointed Gov. Serhiy Taruta, says keeping things running in Donetsk is complicated. After the rebels seized control, the governor, mayor and most of the administration were forced to relocate two hours south to the port city of Mariupol, from where they keep in touch with workers by phone and e-mail. Street sweepers clean up broken glass and debris after a Ukrainian army artillery attack in late August on Russian-backed separatist fighters in Donetsk. One street sweeper was killed in late July by shelling — but the need for a paycheck and the pride they take in their city is what keeps city government workers like these returning to work each day. "We understand that keeping going is the only one way not to go mad in a city which is seized and occupied," Batozky says. "That's why it's so important to water flowers every day ... because people should get the hope that normal life will come back soon." But when the war ends, city workers may face a new set of problems. Donetsk government employees are under a lot of pressure to pledge allegiance either to the Ukrainian government, or self-proclaimed Donetsk People's Republic. Those who choose the losing side could eventually face charges of treason. Batozky says the Kiev-appointed city administration doesn't consider the employees who have stayed behind in Donetsk to be traitors or criminals. But he acknowledges it doesn't take much to cross that line. "In this situation, we felt our employees have free will, and if they choose cooperation, they should understand all of the risks that they will become criminals in Ukrainians' point of view," he says. That's likely why there aren't any Ukrainian or rebel flags and posters in many Donetsk workers' offices. For example, Orthodox Christian icons are the only items in the office of Victor Astakhov. The Donetsk People's Republic referred me to Astakhov for an interview about how the city is running. The 62-year-old engineer is in charge of building maintenance in the Voroshilovskiy district where 85 percent of workers are still on the job. He becomes annoyed and nervous when I ask him about which side he and his men are loyal to. "I have a boss who doesn't know whether he answers to Kiev or the People's Republic," Astakhov says. "In my opinion, it's not Kiev." But the maintenance engineer is more concerned about what's going to happen if the war continues. He says they could run out of building materials as early as next month. The reason is that along with much of the population, the suppliers have left Donetsk.